— This article by Jerry Cates and Steve B., first published in July 2009, was last revised on 23 October 2013. © Bugsinthenews Vol. 10:07(01). I thanked Steve for these photos and asked him to tell me more about the experience, how the snake behaved, its size, and the final disposition of the specimen. Aren’t these images great? I couldn’t thank Steve enough for the excellent job he did photographing this snake. Because of their high resolution, I was able to crop and enlarge certain portions to emphasize important details, including minutiae such as the two small black specks on the parietal scales, between the eyes but posterior to them. Those two small black markings are diagnostic of the genus Agkistrodon, being present not only in the copperheads, but in the cottonmouths as well (in the latter, they are visible only in the juveniles, as the adult cottonmouth head is darkened to the point these black specks are lost). 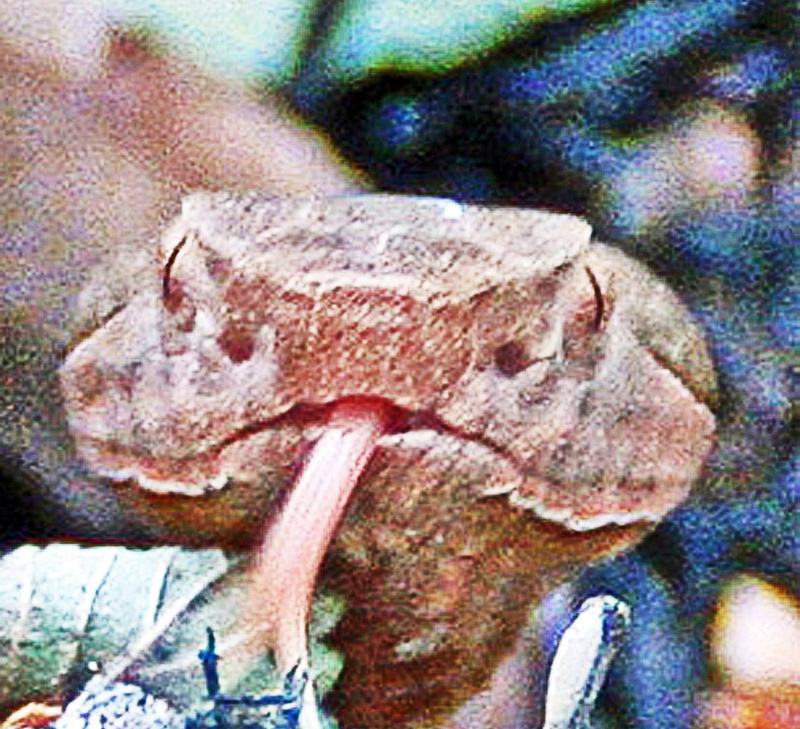 Notice the structure of the head; the area between the eyes and forward to the nose, and backward, to the neck, is–compared to the ordinary non-venomous garden snake–unusually flat on top. This feature is emphasized by the plane of the face, which is offset, by more than 90 degrees, from the dorsal plane of the head, again, in contradistinction to the shape of an ordinary non-venomous garden snake’s head. Many herpetologists have likened the shape of the copperhead and cottonmouth head (being in the same genus, they share many anatomical features) to the hull of a ship. If you know something about the various forms that ship hulls take, good; otherwise, the reference is useless. Let’s try, in any case, to get a grip on the point the herpetologists were making. Not just any ship hull has the characteristics found in the heads of these shakes, so we must look at specially-constructed hulls to see what the herpetologists are talking about. Nautically speaking, the copperhead’s dorsum, nose, and face are, in combination, shaped like the square prow of a ship with a chined hull. Don’t despair at this esoteric term. It simply refers to structures in which sharp angles, as compared to rounded ones, define the structure. Unlike the curved hull of most ships, a chined hull is constructed of flat plates, the way barges and most home-made rowboats are. A chined hull is easier, and thus cheaper, to make. It is also uglier, but it has the advantage of carrying more cargo, and so is often used in the construction of sailing skows. The punt, one of the older designs of hard chine small boats, also has a square bow and stern. The copperhead’s nose is squared off, like a hard chined boat hull, and stuck up at the bow–sort of like the stern of a rectangular rowboat whose uppermost portion projects furthest forward of any other body part. Again, like a rectangular rowboat, the high frontal portion of the nose is a flat, vertical plate that joins with a lower, oblique plate, the latter angled down and back, to the mouth. The flat face on each side of the head defines another offset plane, from the nose to the eye and back to the extremity of the mouthline. Got it? Good. Now, in addition to all that, the copperhead’s lip scales are unremarkable in size, practically indistinguishable from the other scales of the face, and colored the same as the background color of the face. Buy why, you ask, must we spend so much time comparing the shape of the copperhead’s head with the prow of a boat? Because the ordinary, non-venomous garden snakes you are likely to come across do not have these features. It is impossible, for example, to liken the head of a Texas rat snake, or of a nerodian water snake, to the prow of any kind of ship, let alone one with a hard chined hull. You look at their heads, and a ship is just not the first thing that comes to mind. The heads of those snakes, and all the other non-venomous snakes you are likely to see in Texas, have rounded heads, with noses that curve downward to the mouth, not stuck up and squared off the way copperhead cottonmouth heads do. But there are other important differences, too. The eyes of all the pit vipers have slit pupils, like those of a cat, and are quite unlike most of our non-venomous snakes. Were the snake that Steve photographed merely a harmless rat snake, the eye would have a dark, round pupil surrounded by a narrow, circular iris, rather than the thin, dark, vertical slit eclipsed by the expansive, light-colored iris surrounding it, as Steve’s photos show. A prominent, deep facial depression, in front of the eye and below its midline, is another mark of the pit viper. The nostril is not obvious in the above photo, or in the frontal photo shown at below right, but shows nicely in the side view at below left. The frontal view, below right, shows that the facial pit is oriented in a way that opens it to the area directly in front of the snake’s nose. The pit looks just like the torpedo tube of a modern submarine, and the resemblance is not accidental. A torpedo tube is pointed along the submarine’s line of travel to point it in the most useful direction; the pit viper’s facial pits are oriented for precisely the same purpose, though they are merely sensors used to determine where the snake’s primary offensive weapons–its venomous fangs–should be placed. The function of the pit-viper’s facial pit was a matter of deep conjecture for years. Then, as related by Laurence Klauber in “Rattllesnakes” (Abridged ed., 1982), in the year 1937 it was suggested that the pit serves to detect temperature differentials in the snake’s immediate surroundings. In the dark such a sensing organ could aid in locating warm-blooded animal prey. This theory was soon tested on snakes whose other sensing organs (eyes, nostrils, and Jacobson’s organs) were obstructed, but whose facial pits were fully functional. Such snakes sensed and accurately struck heated targets, but failed to sense the same targets when they were allowed to cool to ambient temperature. During extensive testing, it was determined that a pit viper could detect and accurately strike a moving, heated target, within 14 inches of the sense organ, even if the target’s temperature differential was less than half a degree Fahrenheit above ambient. Notice the tail of this specimen, portrayed in the photo above. The tail constricts down abruptly, rather than tapering gently; that suggests this snake is a female. Next, notice that the coloration fades, in the last few inches of the tail, from a pinkish background with reddish brown markings, to a distinctive grayish green. 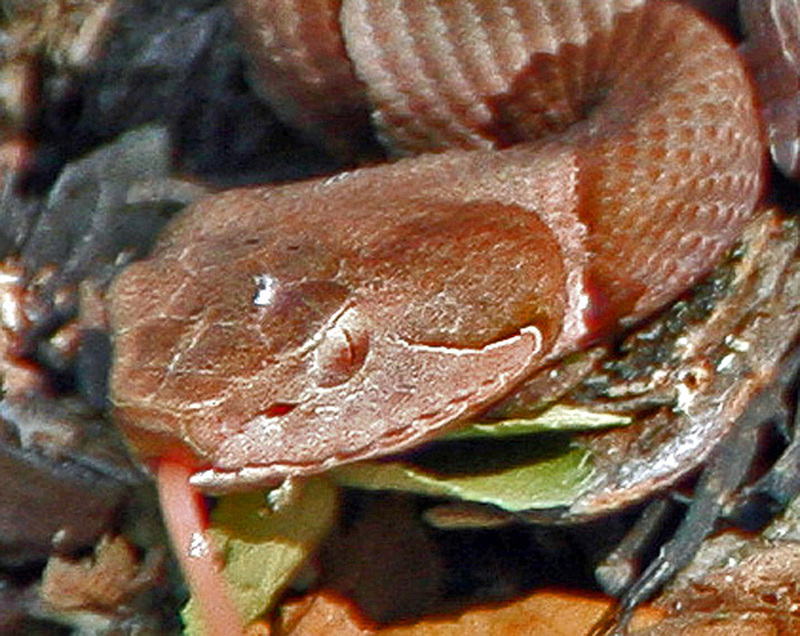 This coloration change is characteristic of the adult broad-banded copperhead, but not of the adult southern copperhead (A. contortrix contortrix) or the adult Trans-Pecos copperhead (A. contortrix pictigaster). Newborns of all three subspecies, however, display greenish yellow tail tips, which some believe help the juvenile lure lizards and frogs to within striking distance. The broad-banded copperhead female carries her young to term, giving birth to litters of 3-11 infants 8-10 inches long, between late July and the end of September. This specimen was between 18-22 inches, which suggests it is one or two years old. The usual length of a typical broad-banded copperhead adult is 24-30 inches. 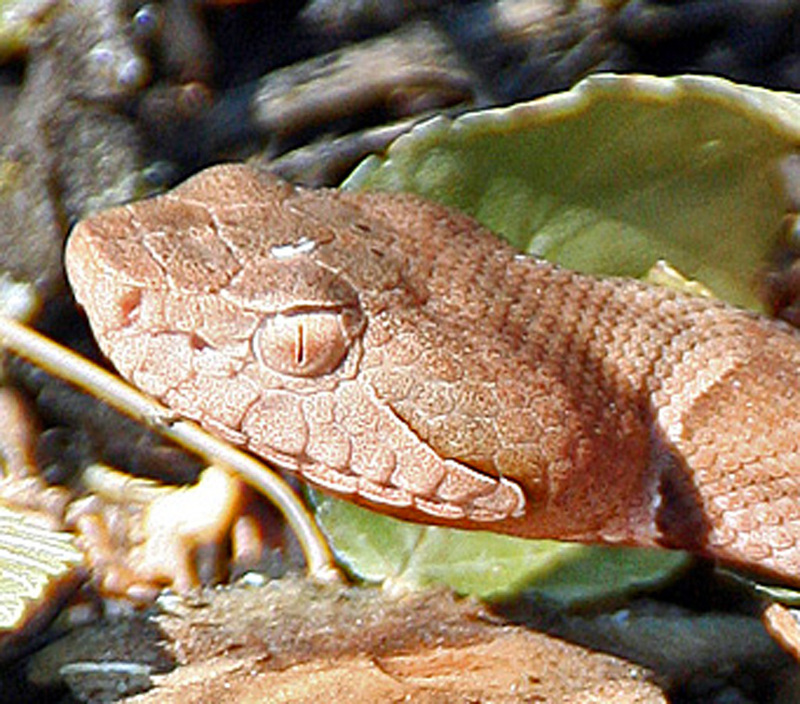 The broad-banded copperhead has wide, reddish brown crossbands separated by narrower tan to pinkish brown intervals that form the snake’s background coloration. Certain of the dark crossbands have small dark spots centered in them, near the belly. When I wrote back to Steve, I asked if he would tell me more about this experience. To those who may be inclined to relocate a venomous snake for its own good, if you are not as experienced in that field as Steve, give good consideration to having someone with more experience, and the right tools, do it for you. Steve later related to me that, a couple of years ago, he found a 4 ft. diamond-backed rattlesnake in this same back yard. At the time, he had a bird feeder on the tree that the squirrels would vandalize, knocking the seed onto the ground. Steve and his family were on the porch eating lunch, and noticed a blue jay pecking around under the bird feeder, when the rattlesnake struck. Steve went to see what was happening, found a very agitated rattlesnake, and ended up shooting it. He sent the graphic photos and I hope to have them posted before too long. Gloyd, H. K., and R. Conant. 1990. Snakes of the Agkistrodon Complex, a Monographic Review. Society for the Study of Amphibians and Reptiles. Tennant, A., 1998. A Field Guide to Texas Snakes, Second Ed. Gulf Publishing. Werler, J. E., and J. R. Dixon, 2000. Texas Snakes. University of Texas Press. — Questions? Corrections? Comments? BUG ME RIGHT NOW! Feel free to e-mail jerry.cates@entomobiotics.com. You may also leave a detailed comment in the space provided below.